Vancouver promotes itself as a modern if not postmodern city. Doug Coupland’s book, City of Glass, rightly captured the city’s look and aesthetic, which is dominated by high rises set against magnificent mountains and the ocean. It’s an exciting place to live, profoundly multi-faceted and rich in diversity. It is a peaceful city with many contradictions, the downtown Eastside being the most visible example of the challenges faced by local governments struggling with the needs of the poor and underprivileged against a backdrop of incredible wealth and economic activity. These contradictions are not unique to Vancouver. But there was always the hope that British Columbia and its largest city would find the measure of these problems and develop creative solutions to envision the city differently. 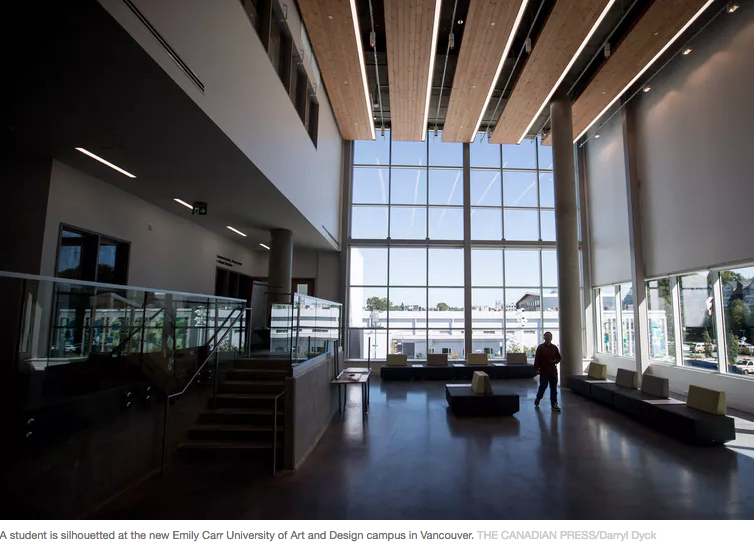 Over the last 16 years, I have been working on the development of a new campus for Emily Carr University of Art and Design. As a consequence, I have learned more than I ever could have imagined about the challenges of creatively engaging with the built environment in urban centres and with the ways in which cities like Vancouver are organized to both facilitate and impede the development of new areas of the city and the buildings we put into them. The new campus is situated on what was the former site of the Finning Corp. Finning gifted 18 acres to four post-secondary institutions in the Vancouver area in 2001: University of British Columbia, Simon Fraser University, British Columbia Institute of Technology and Emily Carr. The gift was generous and was given with the understanding that the lands would be used for collaborative purposes by the four institutions. The initial vision was to build and then share facilities in a cross-disciplinary environment for the benefit of students coming from many different parts of the city. This vision was never realized because the institutions never found the measure of each other’s strengths and never negotiated long enough to make something happen. But Emily Carr decided to go ahead and build a new campus because of the four institutions, it owned no land and had leased its facilities over its 92-year history. Among all the challenges, three stand out: Raising $122.5 million to build the campus; developing the architectural plan for the facility and, finally, the City of Vancouver itself. A summary of just some of the challenges: From permitting through to planning and engineering, differing interests, different personalities, sometimes ambiguous rules and regulations, conflict among people working at City Hall that led to many slowdowns, lack of clarity as to how to achieve the goals of the project, arbitrary interpretations of land use, conflict-laden discussions of transportation, parking and amenities. Sometimes we were told something had to happen because “rules are rules.” Alternately we were told that time did not permit the depth of research required to make changes to existing site and district plans, some of which had been formulated years and decades earlier. Inevitably, this lead to compromises, some good and some bad. Perhaps the most challenging compromise was the grade upon which the building was erected. The costs of following the city plan were not only financial but also affected the design and look and feel of the building. Part of the interior of the building is now underground as a result of a decision that still today feels awkward and unnecessary. The location of the campus means that it could link the western and eastern parts of the city through large open plazas and a permeable campus closely linked to the immediate communities in which it is situated. My ideal scenario would see the area turn into a connector, allowing people to walk from the east side of the city to the downtown core through a series of connected walkways. None of this will be possible because at some point or other plans were developed that now, from all accounts, cannot and will not change. The heart of the issue here is how cities respond to change. I don’t think that Vancouver is unique. Differing interests and contesting values especially around land use and housing are at the heart of debates among citizens, politicians and bureaucrats in all cities. The new campus was completed a few months ago and is magnificent, but all of the problems I have described still exist. As someone who works in an art and design institution, I am amazed that some of the great value that design as a discipline brings to so many areas has not really infiltrated City Hall. For example, how can new building sites be broken down into nodes and networks so that building mass is lighter and less imposing and landscaping is not just peripheral but integral and central? Well, there are at least four different city departments that would have to get together and answer those types of questions. Aside from the challenges of scheduling, it is not possible to bring that many differing interests to the same table in an environment of engaged and productive discussion. Design is a problem-solving discipline and one that, like engineering, seeks answers to difficult challenges. But if the context for problem-solving is unclear, then even the best designers will have difficulties in solving complex issues. Cities have always struggled with the ups and downs of population growth, affordable housing and making space for industry and employers to actually set up their businesses. In all this, no magic solutions have been found to rising costs and decreasing availability in the housing sector. And cities continue to develop their transportation systems without deeper questions being asked about sustainability or even capacity. Some cities grow by design, but most grow incrementally and without a real understanding of the short and long-term implications of planning processes and outcomes and decisions that often ripple far beyond their initial assumptions. It’s almost impossible to sustain a vision for a city without modelling, critiquing and examining the outcomes of decisions made by many different departments, which for most part operate in isolation from each other. As a consequence, cities have large bureaucracies with conflicting interests that often have nothing to do with good policy development or pragmatic planning. They are self-perpetuating machines. They set rules in one decade and hold onto the same rules in another, even when conditions on the ground have changed. Imagine the difficulty for the thousands who work in city halls to engage in an ethnography of their cities and themselves; to research in an impartial manner how people live and what their aspirations are and to try and understand the flow and flux of their everyday lives in the context of policy development. No one has the time for what appears to be an academic exercise and yet this knowledge should drive decision-making. What is described as consultation is more often than not an exercise in futility — not because anyone’s intentions are negative, but because real consultation takes more than a few hours on a Thursday evening. Cities are like onions without a core. The more you peel off, the more challenges there seem to be. And the beauty of this contradiction is that cities are resilient inventions, able to outlive poor government and poor governance, able to grow in response to the elasticity of the economy, full of culture and cultural activities, vibrant and in some cases genuinely open-minded. The challenge is that cities and the people who live in them have different and sometimes unusual expectations. What’s more, cities are places that change by the day if not by the hour. Cities scramble to keep up, including Vancouver. We need new models for the planning process. We need to think about cities as living organisms, and most of all we need to face the mistakes head on. Vancouver may see itself as postmodern, but it has fallen far behind cities like Melbourne because in all the areas to tick off in discussing cities — road safety, traffic congestion, integrated transportation systems, varied approaches to the movement of people, (why isn’t there any light rail in Vancouver? ), housing affordability, access to services, traffic management, cultural venues and streetscapes, and yes, the role of bikes — Vancouver is not in the game. Its development and discussion of policy does not attract open debate and true dialogue. The control that City Hall exercises over development is more bureaucratic than progressive, and it seems to be pedalling backwards as the city accelerates. Vancouver is indeed, at this moment in its history, a city of glass.